A couple weekends ago we spent a few hours at Color Me Mine with friends and got creative! We had a good time, but I didn’t go in with a plan, and so I panicked. I think this dish came out better than my last. 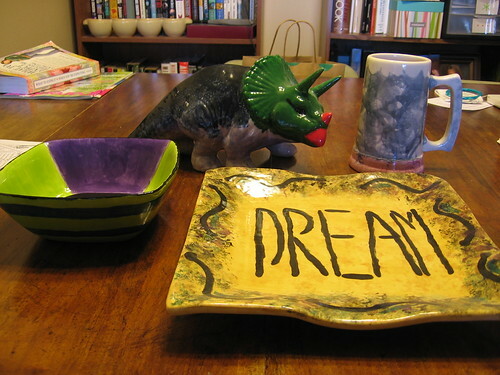 See the rest of the (unglazed, unfired) creations that Miles took pictures of or read Miles’s short post about the adventure. Remember when I wrote about starting to lose weight? And how I hate exercise? Well, just writing that I hated exercise was enough motivation for me to start exercising the very next day. I’m now doing some sort of exercising 5-7 days a week. Typically, 6 or 7. Even if it’s only 15 minutes. I’m using workout videos at home and sometimes going to our dinky gym in our apartment complex. I don’t love it, but it’s not as much of a chore and really become a part of my routine. Someday soon, my schedule will change, as my temporary employment comes to a close. But until then, I’m moving forward with what’s working. I’ll figure it out later. And so far? I’ve lost 29.2 pounds. I’ve never been able to stick with it enough to see any more than a 5 pound loss. I think it’s impatience. But I’ve been able to push past that. The weeks are going by much faster. 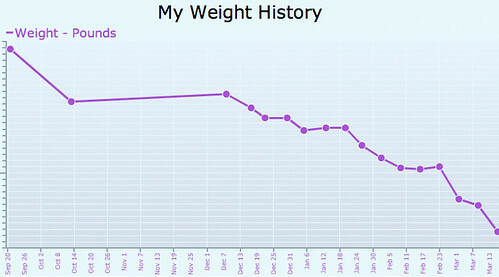 If you look at the graph, you can see my progress in a visual way (of course, I’m not going to let you see my weight even now!). You can see my losses, plateaus, and gains. 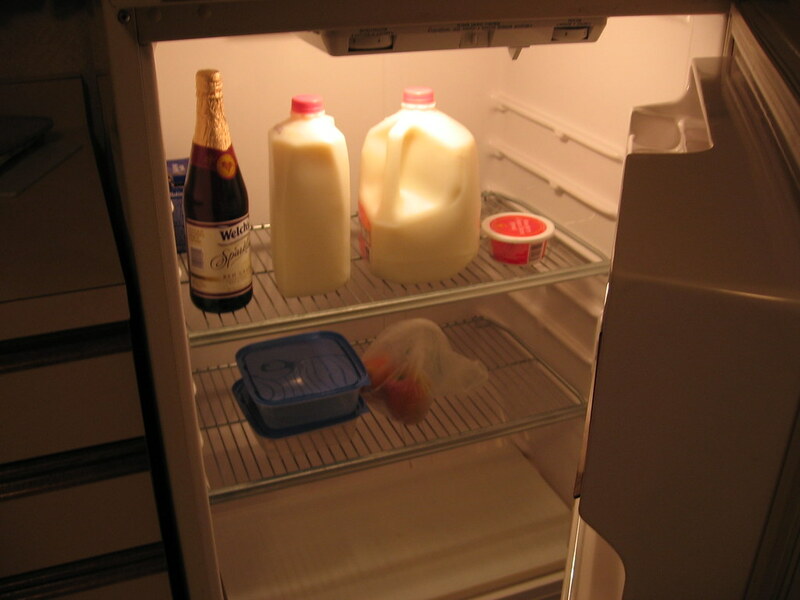 The times that were most demotivating were the weeks where I’d only lose like .2 pounds. They were worse than gaining or plateauing for some reason. I started to change my habits in September. I weighed myself and I was about 17 pounds more than I’d ever weighed in my life. And I didn’t want that for my future, because it was likely going to get worse. I had lost 8.4 pounds and then we found out we were pregnant. So cutting calories was no longer an option, but I did make an effort to make healthier choices. I gained a little under two pounds from October to December. After we found out about the miscarriage, I decided I needed to get back in the mind frame of losing weight. Being pregnant and as heavy as I was only caused anxiety for me that I would have complications later on. Next time around, I didn’t want to have so much fear about my weight causing problems in pregnancy. It’s really been a big motivation. I’ve also been drinking 6-10 glasses of water a day. (But typically not that much on the weekends.) I’ve found it to be pretty easy to do at work as long as I remember my water bottle. And I haven’t had a pimple in weeks. I set up goals for myself. One big one and a few small ones. Lose 10% of my weight in 12 weeks: I made it exactly, to the day. Lose 25 pounds by my birthday (April 15): I made it, more than a month before that goal date. Lose 30 pounds by Memorial Day: I’m well on my way for this one. Lose 50 pounds by Christmas 09: Over halfway there. I feel good. I haven’t bought clothes since September 08, so I don’t know how many sizes I’ve gone down. If I had to guess by the way my current clothes fit, maybe two sizes. My pants especially are pretty baggy. I’ve gotten creative with my ways of holding them up, since most of my dress pants don’t have belt loops. My shirts I could wear for a while before I look frumpy. The shirt I’m wearing today is a button-up. It used to pull really tight when I’d button one in the middle over a tank top. Today, I have two buttons buttoned and it looks pretty baggy. I could button them all, if I chose to wear the shirt like that, and it still wouldn’t pull. There are buttons on the sleeves and I’ve never been able to wear buttoned until today. A few weeks ago I was able to wear a sweater that had been too tight on me for months. It’s a good feeling. Will the show still be awesome, even though it’s not on our big screen HD TV, but on our 24″ iMac? How are we going to stay sane, knowing every one of our fellow LOST friends are watching the show, and we aren’t? How are we going to keep from stumbling upon spoilers? How are we going to be focused at work the next day, waiting until supper time when we can finally sit down and watch the show? 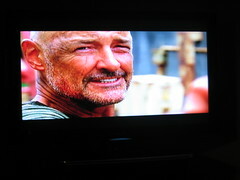 It may not be on the big screen, but it’s iTunes’s HD quality and our computer screen is pretty frigga big. If we really had to, we could hook it up to the TV, but have not found the need as of yet. I go to bed early (see solution number 4 for explanation). Sign off Twitter, avoid Facebook, and any other way we could unknowingly discover spoilers. People tweet things and update their statuses about the show and if we didn’t do those things, we’d ruin the episode entirely. We can’t control their actions, but we can control what we stumble upon. I didn’t check my email in case someone wrote on my wall about it. Basically, we become nonexistent on the internet. And we told everyone we could think of that we knew that we wouldn’t be watching it on the night, so don’t talk to us. The premiere night, we even turned off our phones in case someone texted us that didn’t know. We don’t wait until suppertime the next day. I wake up at 4:30 and check iTunes to see if it’s available for download (it always is). I make sure it’s downloading correctly and go back to bed. I wake up at 5:30 and make sure it’s done, put blankets on the couch, start coffee, brush my teeth, and wake up Miles. We watch. Typically, we finish it at about 6:30 or 6:40. Without commercials, it’s only 42 minutes long, but we pause it to discuss what just happened or make a prediction or freeze a frame to try to read something that seems like a clue or rewind it because we couldn’t understand what they said. Then we get on with our day and return home, eat supper, and watch it again. (Even for LOST, our heads aren’t always completely clear at 5:30 a.m.) You might wonder why it’s me who wakes up early, and not Miles. Several reasons: I don’t go to work until 10:00, so if I’m really tired from waking up at 4:30, I could technically take a nap before work. I can go to bed at 8:30 p.m. easily. I’m way better at waking up and focusing on something immediately. I have less patience than my dear husband, and simply would not make it through Thursdays without having seen the episode. Why do we do this? Well, if you’re asking that, then I know you don’t watch LOST. Is it an obsession? Probably. But I really don’t know any LOST watchers that are just “so-so” into it. Like our friend Debra always says, go big or go home. We’re all obsessed. Speaking of obsession, we’re probably going to have another LOST party, complete with Dharma food and drinks. It’s been a year since our last one. That was fun. For this one, we will be rewatching Season 5. Though, we’re thinking it will either be the weekend before the season finale or after the season is over. So you have time to catch up if you’re behind or need inspiration to start watching. It’s an hour past my Wednesday night bedtime. I’d love to end this post with the sound at the end of every LOST episode, where you know it’s done. But Miles and I can’t figure out how to spell the onomonpoeia. Even though not much had changed in the cabins, or the resort as a whole, it was a really great weekend. We had planned to do it sometime around Thanksgiving, and after having the miscarriage, we really needed something to look forward to and to get away from everyone for a while. (Literally. The only internet access was in the lobby, which was quite a ways away from the cabins.) I showed Miles around and told him stories about certain places we’d see. Most of my memories were at the pool. Mom, remember when Marissa almost drowned when she was like three because she fell off the steps she was playing on? Glad that man came to her rescue. Looking at the hot tub, I remembered all those times I really wanted to sit in it, but I was too young (you had to be like 14 to sit in the hot tub). Still, I never have sat in it. Also, it was on the way to Okoboji that I learned how to pronounce “apostrophe”. My friend, Kyra, came with us that weekend because it was my birthday and my celebration was bringing a friend along. We were in third grade and in the van, we were asking eachother questions from those Brain Quiz things (is that what they’re called?) But she was smarter than me, and had the 4th grader version, so the questions were a bit tougher. I was asking her where the apostrophe goes in a particular word and I pronounced it appa-straw-phee. She corrected me. I felt foolish and scared of 4th grade. But never again did I mispronounce that word! There isn’t much to do in Okoboji in the off-season. But, some camp friends were getting together for a game night that weekend, so we spent an evening playing games. We watched a lot of TV shows and just hung out together. It was fun. Though if we return, we’d likely go back in the spring when things are a little more happening. Pictures (and a video) can be found on Miles’s Flickr set, 1st Anniversary. This will be the site where we post about what’s going on in our lives. In the future, it will be the blog for our family, where we post about what we’re up to and everything. Eventually, I will design the blog to be more personal and Miles will do the programming necessary for it, but right now this template will have to do until he has freetime. I’m making Hollirausch.com more of a professional blog, so feel free to keep reading and commenting there, but know that this is the site you need to visit to find out what’s going on in the lives of the Miles Rausch Family! No computers were harmed in the 0.243 seconds it took to produce this page.